Just to clarify, I am not vegetarian or vegan, I was vegetarian for a year. I would kind of call myself a reducetarian where I find myself eating meat a couple of times a month at most, some weeks I don't even eat meat and my food shop always consists of Quorn. I have recently found my breakfasts to be quite boring. Vegan breakfasts always look more enjoyable to eat and I am terrible for eating fruit so I thought it would be a great way to introduce more fruit into my diet. 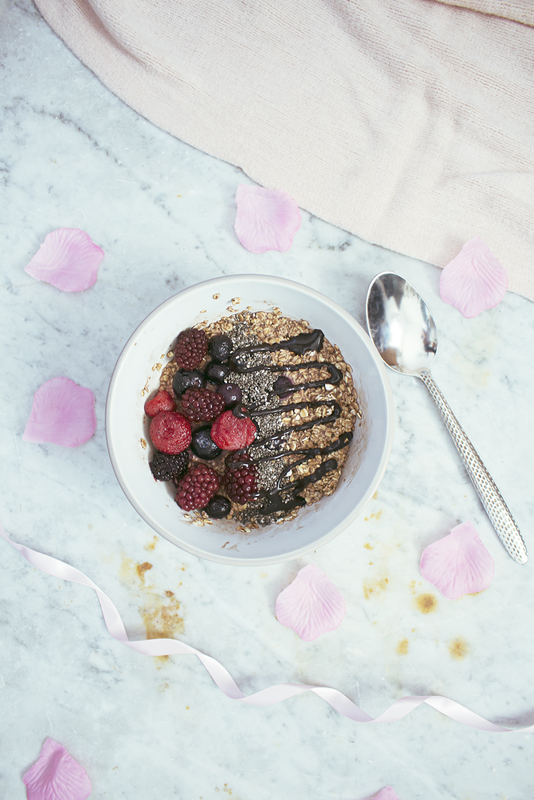 Grab a bowl and a pour 1 cup of rolled oats and 2 cups of chocolate soya milk together and coat the rolled oats making sure they are saturated in the chocolate soya milk, place in the fridge overnight. The following morning arrange your choice of fruit on top of the rolled oats. Sprinkle a tea spoon of chia seeds. Finally drizzle in chocolate vegan sauce.